Never underestimate the inspired perversity of artists. Consider a central paradox of 21st-century pop : at a time when musicians can instantly summon an infinitude of sounds, easily tune them into any melodic contour and digitally layer as many tracks as they want, austerity rules instead. Maybe it’s a premonition of making do with less in some coming era of scarcity ; maybe it’s an instinctive withdrawal, or a vacation, from too much information. But from Top 10 hits built on little more than a buzz, a thump and a hook, to the arty recesses of the most minimal techno, musicians have been vying to strip music down beyond the skeletal. What once were considered basics can now sound lush as producers become reducers, trading sounds for spaces. They know that nothing is final, because if necessary, a remix can fill in the blanks. Björk, whose seventh album, “Medúlla” (Elektra), will be released this week, has made a career of subtraction. She recorded boisterous rock with the Icelandic new wave band the Sugarcubes, started a solo career with eccentric dance-floor hits and then followed through with a series of albums that have been unpredictably sumptuous or sparse. As early as her 1993 album “Debut” (Elektra), Björk was poking holes in her music, and since then those holes have been widening into chasms. With “Medúlla,” she pushes to a new extreme : most of the music is made with voices alone. While the album might seem to be a conceptual stunt, it finds gorgeous and startling new ways to extend Björk’s longtime mission : merging the earthy and the ethereal. Björk’s voice sounds perpetually guileless, an illusion that is helped along by her accented English. It allows her to get away with ideas that might seem absurdly pretentious coming from anyone more overbearing. She can be breathy and girlish, clear and sultry as she seizes a phrase, then almost shattering as her voice crests with a rasp. Her singing sounds impulsive and immediate, yet her voice is deployed as carefully as her backup, which deliberately juxtaposes more polarities : simple and elaborate, organic and synthetic, whimsical and profound. On her solo albums, Björk has frequently abandoned a straightforward beat, replacing it with sustained harmonies or electronic stutters and flickers (though thumping remixes have kept her songs in clubs). She has sung with string quartet, sitar, big band, shimmering keyboards or rough, blotchy distortion. Björk and her producers often build a track from just two disparate elements that are somehow bridged by her voice, a method that comes across not as idle eclecticism but as improbable alchemy. Her previous album, “Vespertine” (Elektra) in 2001, cocooned her voice amid quiet, staticky electronics in some songs, full orchestra in others. “Medúlla” (Latin for marrow) finds nearly all of its contrasts in the spectrum of vocal sounds : percussive, sustained, crystalline, raw. 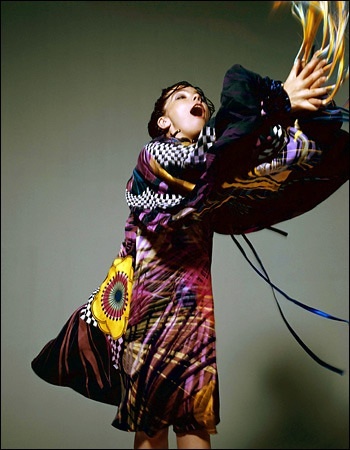 It’s not obsessively purist ; Björk does allow herself an occasional synthesizer line or piano chord, and often the voices are sampled and programmed like dance tracks. “Medúlla” sidesteps rock’s longstanding a cappella style, doo-wop, to reach a sonic realm only Björk would concoct. She’s gone globe-hopping to find very particular extensions of herself. When there’s a beat, it comes from a human beatbox (or one whose sounds have been rearranged by programmers). Classical choirs provide airborne harmonies that suggest composers like Penderecki or Arvo Pärt. Meanwhile, Björk and guests like Mike Patton (from Faith No More), Robert Wyatt (the British art-rock songwriter) and Tanya Tagaq (an Inuit throat-singer) add mews, moans, counterpoint and guttural grunts. The album includes vocal fantasias that lean toward chamber music, with many Björks looped and echoing, alongside songs that are obviously but distantly connected to hip-hop. There are also glimpses of Bulgarian women’s choirs, the hooting polyphony of central African pygmies and the primal vocalisms of Meredith Monk. Throughout the album, the music is transparent, with each component distinctly audible, even when Björk’s melody is strung between a dissonant choir and a growled beat. Listeners will have to be flexible themselves to accept “Medúlla.” It leaves gaping holes where bass lines are expected ; it has dissonant clusters of voices instead of a band. It’s music for a very private space, not a public arena. Yet along with its more abstract pieces, “Medúlla” has half a dozen songs with verse-andchorus pop forms : songs that Björk chose to orchestrate for castles in the air rather than more utilitarian locales like clubs or radio formats. Songs like “Where Is the Line” and “Who Is It” are wide open with complex superstructures, catchy but ghostly, and they probably haven’t seen their final incarnation. Their spaces are not just a matter of serene artistic restraint. They are also invitations, offering both places where listeners can take refuge and openings for musical transformation that could carry the songs from Björk’s inner landscape to less subtle, more communal spheres, like dance floors. Complete in themselves, they also await their remixes.